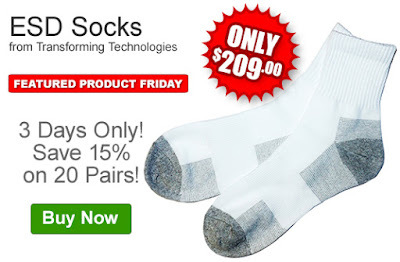 Save 15% off the MSRP of 20 pairs of Transforming Technologies ESD Socks. Our FPF031816 Coupon Code is auto applied when you add these socks to your shopping cart. This Featured Product Friday (FPF) promo is valid from today, March 18, 2016 through Sunday, March 20, 2016 and the code is unlimited use. These ESD Socks are worn with ESD shoes and create an effective way to ground personnel when combined with ESD flooring. They feature conductive hotspots woven into the ball and heel and are an effective alternative to wrist straps. For further questions about Featured Product Friday, please read our informational blog post, call us (800-966-6020), or send us an email. Please note: This promo is valid only at QSource.com and expires on March 20, 2016.